Now free to download is our new Excel call centre forecasting template, which will assist your call centre’s capacity planning, demand and call volume forecasting processes. 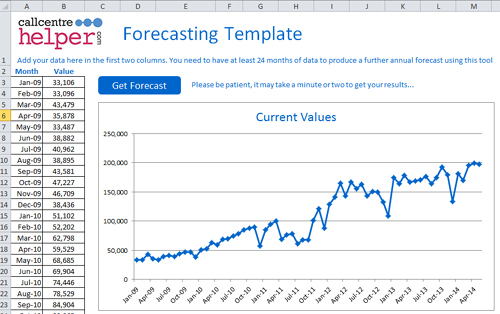 or Click here to download the Forecasting template. How to Forecast with Minimal Data. You can then used these reports for capacity planning purposes. The forecasting template has been designed to work with call volumes, but could easily be adapted for other types of monthly forecast. • A seasonal adjustment – based on previous data for the same months, e.g. you might expect customer calls to go down in December or rise in July. • A trend – whether your values are generally growing or shrinking over time. • A level – a baseline for your values once the other components have been removed. To get the calculator to work you must enable macros in Excel and have both Analysis Toolpak and Solver installed in Excel as Add-ins. You will find more instructions on checking whether they are installed and how to add them here. If you prefer to print out the instructions you can also download the instructions here. This explains a little about how the calculations are performed and has the instructions for installing the Add-ins and using the tool. We have also created a how-to guide on YouTube. You are free to use the forecaster in all of your projects, provided that you do not resell or distribute the tool on the web. If you spot any bugs in the spreadsheet or if you have any feedback please send us an email or leave details in the comments below. Open the spreadsheet and enable macros (or Enable Content) if you are prompted to do so. You will need to have at least 24 months of data in order to produce the next 12 predicted months. You can probably get this data from the call volume reports on the Call centre system. When you open up the tool you will see that it has some dummy data in it, and you should be able to see a chart, with the data that feeds it to the left-hand side, starting with the oldest month in cell A3 and the oldest value in cell B3. You can add as many values as you wish in columns A and B. Please don’t leave any gaps in the data. You can replace the values by simply overwriting them or copying and pasting data from another spreadsheet, as long as it is the same format of date in the first column (dd/mm/yyyy) and value in the second column. It’s best to Copy and Paste Special (Paste as Values) to be absolutely sure that you don’t inadvertently copy over any formulas from elsewhere. This is fine, click OK and the chart will refresh and show just one point in the centre. When you enter your new data, the chart will redraw with the data you’ve entered and everything should work. Click the blue “Get Forecast” button and Excel will start to use Solver to find the most likely next points for your data. You will need to be patient at this point. It can take around 20-30s for Solver to settle on a most probable solution and you will see numbers changing at the bottom left of your screen as different values are tried out. After this time, you will be taken to the Forecast and you will see a new chart with the next 12 predicted values showing in red. The next 12 predicted months and forecast values are shown to the left of the chart. Your original data also exists in this sheet but the rows have been hidden, leaving only your forecast visible. If you’d like to forecast even further in to the future then you could take these values and transfer them back in to the data worksheet at the end of your current data, then run the forecast again to get another 12 months. In this way you could try to forecast a few years. 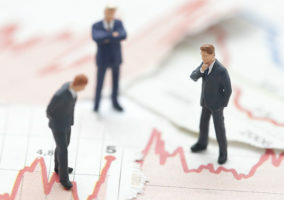 Have a read of our FAQs- Call Forecasting with Spreadsheets article, for the answers to 17 common questions with forecasting with spreadsheets. 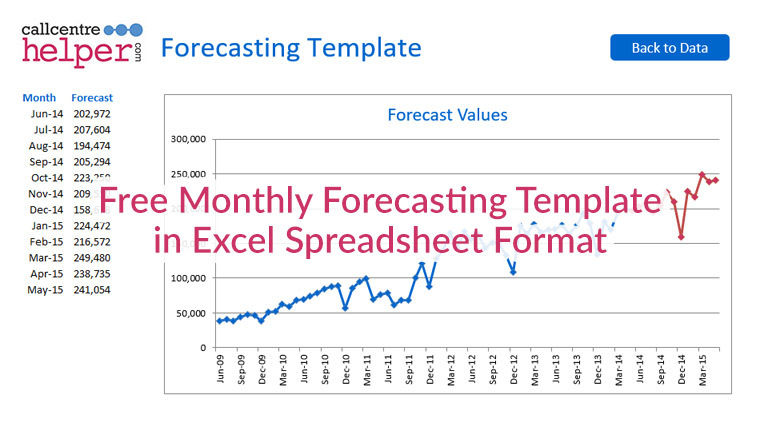 The forecasting spreadsheet just works out the monthly predicted call volumes. If you want to use it workforce management, for scheduling your call centre, you will need to break down the outputs into a daily and then hourly forecast. You can then plug the numbers into an Erlang calculator to get the numbers of Agents or FTE required. or Click here to try our online forecasting tool. Please could you email me a screenshot of the error and a copy of the spreadsheet. The details are on the contact us page. How come it outputs a different forecast everytime i run it with the same historical data?. Can the spreadsheet be configured for weekly forecasts? If so, how would the spreadsheet be edited? Try re-downloading the spreadsheet. If you still have problems send us in the spreadsheet and we will see if we can fix it. I am getting the same error (Compile error: Can’t find project or library) I tried running it with the sample data, it didn’t work. I also tried my data and it didn’t work either. Maybe the download file needs to be replaced. It appears that this version of the template requires excel 2010 as in the 2007 version evolutionary options are not available. Show Trial Solution – The maximum number of subproblems was reached; Continue anyway? My choices are continue, stop or save scenario? What is causing this pop up alert? Hi Angela. This tool uses a feature in Excel called Solver, which will run through many options for the future values until an optimal solution is found that fits well for a number of the original values. Sometimes if the original data is not regular or well defined then it can take longer to reach a solution as there can still be large differences in the new values that Solver has found – and there are constraints on how many gos it has so you’re not sat waiting forever! When you get that message you can either choose to continue and solver will carry on trying to find a good best fit, or you can show the trial solution and see if you’re fairly happy with what it has come up with. You could then run it again and see how different the forecast is, which will give you an idea of how much it’s struggling to make sense of your original numbers. Hi. Good day, it seems there is a Macro error. Is there a way we can make it work? anyone getting the solver issue when running? I have solver installed but errors on MAXTIMENOIMP, Solutions anyone? I was VERY interested in using your forecasting template … alas, we have Excel 2010 installed, and the Solver seems to be incompatible with your macro. For example, the MaxTimeNoImp as well as MaxSubproblems are not recognized and give a compile error with “Named agument not found” explanation. 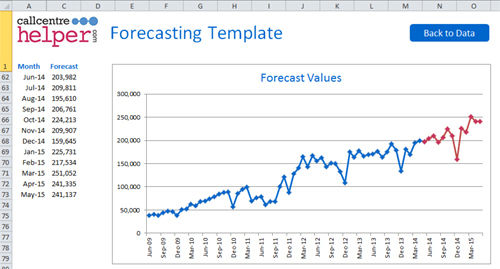 Would you have an older version of your Forecast Template cmpatible with Excel 2007 Solver? sorry for the typo in my previous comment. Re Mike’s comment (Jul 21st), seems you have the same issue than I have encountered. “If you want to use it for scheduling you will need to break down the outputs into a daily and then hourly forecast. You can then plug the numbers into an Erlang calculator to get the numbers of Agents or FTE required”. 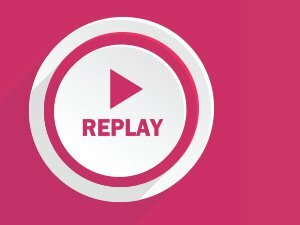 Does anyone have the version that works with Excel 2010 or higher ? It should work with the latest version of Excel. You need to have the add-in packs in Excel enabled. How come it outputs a different forecast every time i run it with the same historical data ?I ran it 5 times and I got ( although very close) different data. This is because it is a simulator. It generates a random arrival of calls, emails and web chats – just as happens in real life. Sometimes the calls will be bunched together and sometimes they will be spaced out. If you run it a few times you will get a better idea of the average and peak number of staff needed. I am interested in using this, but want to make it a weekly version. Is there a weekly version available? If, not what needs to be changed to make it so? Also, In the Calcs tab I did not see a note in the video if any of this data needs to change? Does it? If so what needs to be changed? Where does the Factors data come from? It’s not very easy to convert it to a weekly chart as all of the formulas need to be reset. We are working on an online version that should be able to take weekly inputs. Do you have an answer to my question for the Cals tab? How does one break down the outputs into daily and hourly intervals? I am getting the same compile error. What is the work around for it or is there any other similar excel sheets available. Is it necessary to change the data on the Calcs? I noticed that if I change the information on the data tab, that it doesn’t change it on the Calcs tab. So is there any response about the macro error? Hi just had the compile error that people have been mentioning. I resolved it on excel 2016 by going into options and enabling the “analysis tool pack” and “solver” add ins and the “analysis tool pack – vba” and “solver” add ins. Works fine for me now. Hope that helps people with the macro/ compile error.